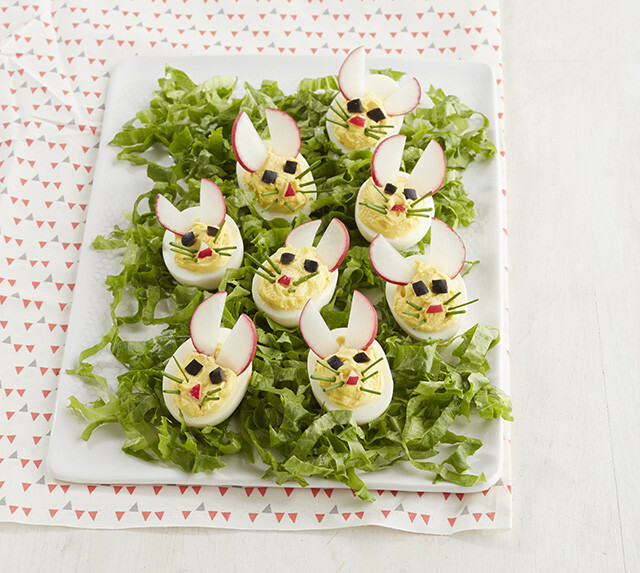 Make these adorable Easy Bunny Deviled Eggs! These cute, spring-time favorites are great when served as a brunch side. Cut eggs lengthwise in half. Remove yolks; place in medium bowl. Add cream cheese, mayo, mustard and onion powder; beat with mixer until blended. Spoon yolk mixture into egg whites. Cut both ends off each radish; cut into 24 small pieces for the bunnies' noses. Cut each of the trimmed radishes into 6 lengthwise slices, then cut each slice crosswise in half for the bunnies' ears. Decorate eggs with radishes, olives and chives as shown in photo. Substitute MIRACLE WHIP Dressing for the mayonnaise. Omit radishes and chives. Cut eggs crosswise in half using a zigzag cut. Remove yolks and use to prepare filling as directed. Decorate with olive pieces for the chicks' eyes. Add small notched baby carrot slices for the beaks. If you don't have a mixer, you can instead just mix the egg yolk filling in a medium bowl by hand.